Howard: Even though Giovanni’s has only been open for a few weeks, we here at Eat to Blog already have a complicated relationship with the restaurant. Giovanni’s was opened by the people who ran the recently closed Sette; in fact, the website says that Sette has “re-opened as Giovanni’s”. So why is it a complicated relationship? Because Sette is the place where Eat to Blog was conceived, four years ago. And the meal we had there wasn’t very good. So when our friends Matt and Phaedra suggested meeting at Giovanni’s for brunch, I agreed, but with some trepidation. I was pleasantly surprised by the quality of the food. I started with ricotta fritters; warm, rich, and filling. 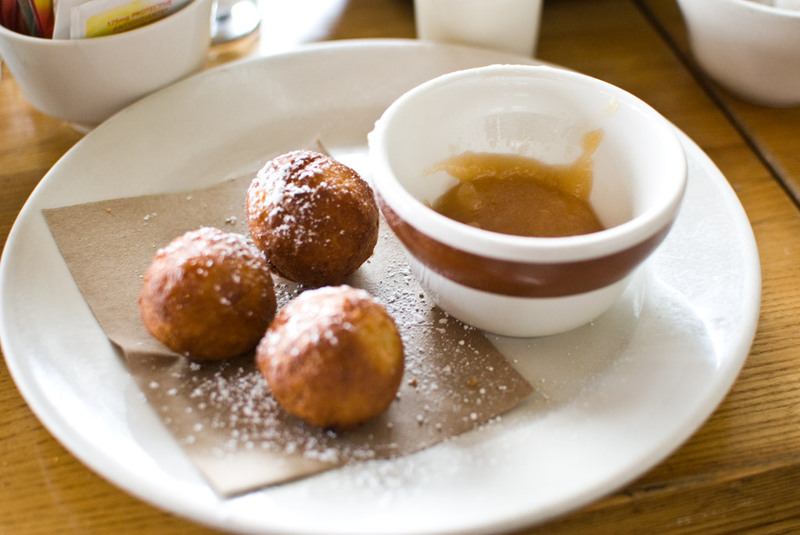 The fritters were served with apple sauce for dipping. 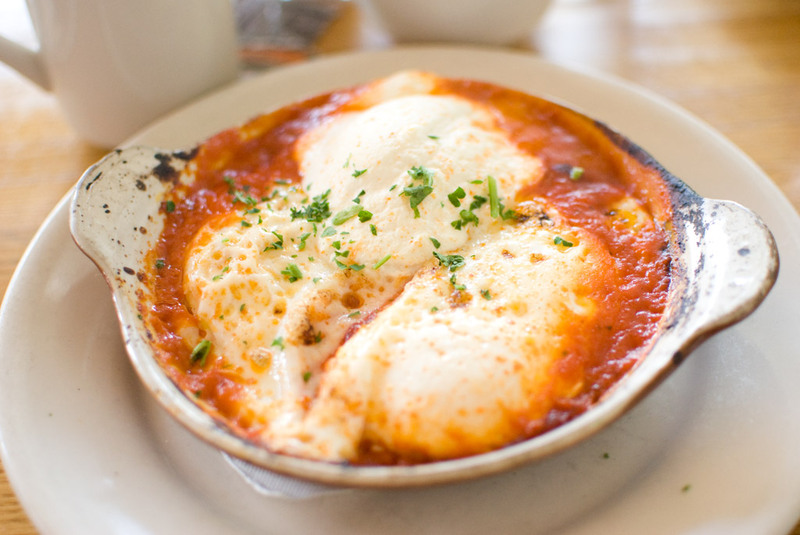 My friend Matt wanted me to get the “Double Egg Plant” (it’s eggplant with an egg on top; picture above) but the baked egg with polenta, tomato sauce, and ricotta was calling to me. It could have used a little more salt, and the egg could have been runnier, but it was an unctuous bowl of rich flavors and textures. Matt ended up ordering the eggplant himself, so I got a bite of it and it was quite good — good enough that I would order it if I went again. 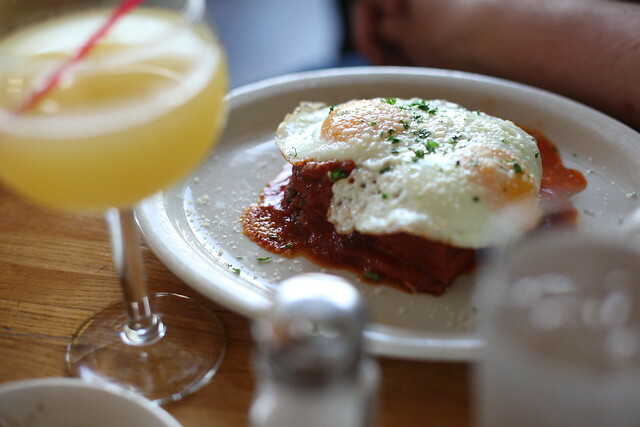 I know I’m on record as being anti-brunch, but Giovanni’s was a pretty good experience. Donny: It was really cold that morning so I went for the Soup of the Day. 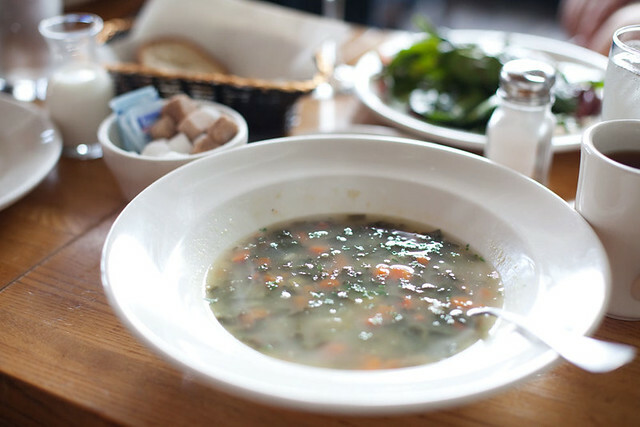 Like Howard, I was pleasantly surprised by how good the soup was (or maybe I was just too hungry and cold) and it was quite comforting. 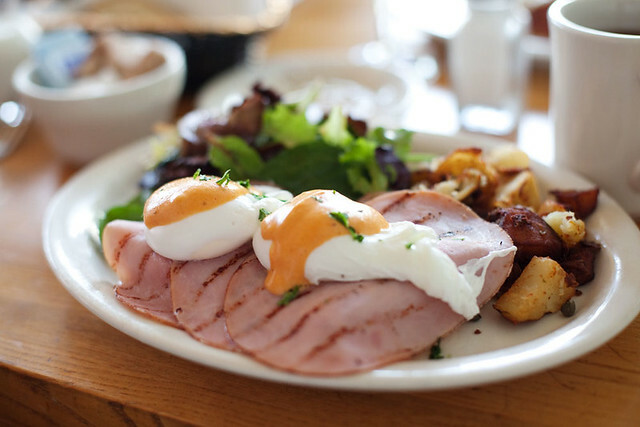 As for my entree I got the poached eggs over toasted bread and black forest ham. It came with home fries and a salad. I wasn’t too thrilled about this dish. The two pieces of bread were a little tough and quite difficult to cut through them. One of the eggs was poached a little too long and so the yolk wasn’t runny. I mean it was a decent plate of food but who the heck cares when you get unlimited refills of mimosas and bloody marys.